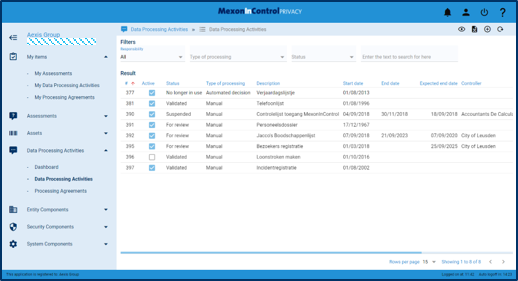 MexonInControl for Privacy is an online service (Software-as-a-Service) with which every organization can build the registers required for the GDPR. Registers for processing activities, processors, processing agreements and Data Protection Impact Assessments. The General Data Protection Regulation (GDPR) has given organizations, that process personal data, a number of new obligations. Many organizations try to get those new aspects, the creation of registers, under control with tools that are available. Microsoft Excel is such a tool that is often within reach. Excel provides a dynamic start, but also has limitations that make many a register falter. The purpose of the GDPR is to protect privacy. Failure in that domain is not an option. The choice of a simple, insightful, reliable, well-arranged and transparent tool is desirable, if not necessary. MexonInControl for Privacy is our SaaS solution with which the first step is taken to comply with the GDPR obligations regarding registers. Create with minimal effort a solid and quick result. The GDPR imposes more responsibility on organizations. Openness, transparency and accountability are important issues concerning privacy protection. Each organization has to assess and document how much they are affected by this regulation (in other words is personal data being processed). The conclusion of this research must be documented, even if there is no processing of personal data! For the research (assessment) it is important to have insight in the processing activities. 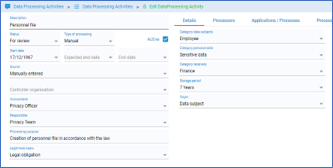 Setting up and correctly filling the register of processing activities is an initial activity that directly meets an important requirement in GDPR. By executing a Data Protection Impact Assessment (DPIA), independent of the form (small or –very- extensive), the current status will be clearer, including which areas need attention. By filling a register of processors and processing agreements these aspects will be more under control. These components form a solid basis for meeting the requirements of the GDPR, particularly because their mutual interdependence can be documented. Every organization has branch specific characteristics. MexonInControl for Privacy is characterized, among other things, by the high degree of flexibility with regard to the basic setup. This means that a register can be configured for any organization, with the concepts that are customary in your sector. This applies to the labeling of fields and columns and also to the values that can or may be entered therein. You also decide yourself which data is visible, hidden or mandatory. The entire lifecycle of an assessment is supported: from linking to a specific scope, assigning to people, following the status, reviewing the result, assigning a follow-up assessment, saving and printing. Assessment templates can be adjusted or added as needed. Do you want to know what the MexonInControl for Privacy can mean for you? Then contact us by email mexonincontrol@mexontechnology.com or phone +31 33 432 17 00.